Do You Need a Proven Heavy Construction Firm for Your Next Project? Established in 2001, Griffin Contracting is locally owned and operated. We are a heavy construction commercial contracting business that can handle every aspect of your construction needs. We specialize in site preparation, structural concrete, paving, milling, crushed concrete, utility work, roadway construction and demolition. Our affiliated companies, Griffin Labor and Griffin Materials, also provides temporary experienced workers, on demand as needed, and construction materials delivered to your construction site. We are proud to work with a variety of different clients throughout Southeast Georgia, the Carolina Lowcountry, and North Florida. 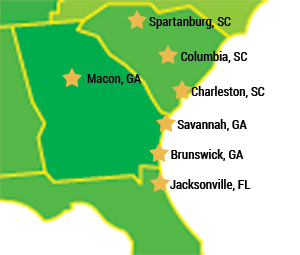 We’ve completed both large and small projects in Spartanburg, Columbia, Charleston, Jacksonville, Macon, Brunswick and, of course, metropolitan Savannah. Some of the clients we work with include public utilities, construction managers, local and state governments, commercial and residential developers, civil engineering firms and transportation authorities, among others. Phone: 912-965-0111 | Email: sales@griffincontracting.com. Customers just like you turn to us time and time again because of our wealth of experience, the quality of our work, and our exceptional customer service. In fact, it is arguably our experience and expertise that has earned us a solid reputation for delivering our client projects on time and within budget. As a comprehensive commercial contractor, our customers turn to us for construction services as varied as pouring concrete, laying asphalt, taking down buildings, digging and installing sewers, excavating roadbeds and driving pile, to name a few. In particular, we are well known for our comprehensive asphalt milling and crushed concrete capabilities. As mentioned earlier, we also provide on site construction materials, such as topsoil, crushed concrete and bulk seal coating products for projects of all sizes through our affiliated company, Griffin Materials. Additionally, Griffin Labor, our on-demand temporary labor company, furnishes the skilled labor you need when you need it to complement your existing workforce. In short, when you choose to work with us at Griffin Contracting, you choose a single source contractor that has the resources, experience and wherewithal to see your construction project through from start to finish. © Copyright 2017 Griffin Contracting, INC. All Rights Reserved.